My girlfriend, Jo, and I were looking for something fun to do over Labor Day weekend - my only real “vacation” opportunity for the summer. We thought we would head over Independence Pass from Aspen to the Buena Vista, Colorado area to do a little hot springs soaking and some hiking in an area we had not explored before. We hadn’t really planned on hiking all the way up one of Colorado’s 54 (some say 58) 14ers, but that’s what we did! 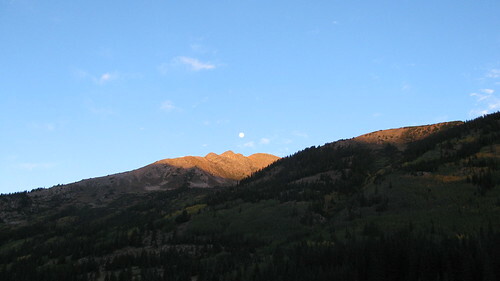 I'm sure I'm not unique, but even though I grew up in Aspen, Colorado, have lived here for most of my life, and have found myself fairly high up in elevation numerous times, I had never actually summited a 14er; and at this point, climbing one was not a consideration. Not surprisingly, our last-minute planning would not allow us to stay at our originally-intended destination, Mount Princeton Hot Springs lodge, but we were able to book a room at the Lakeside Motel in Buena Vista, satisfied that we would still be able to enjoy some hiking and hot springs soaking somewhere. 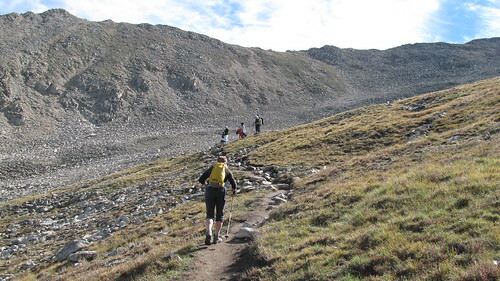 The thought of attempting a 14er still hadn’t set in. 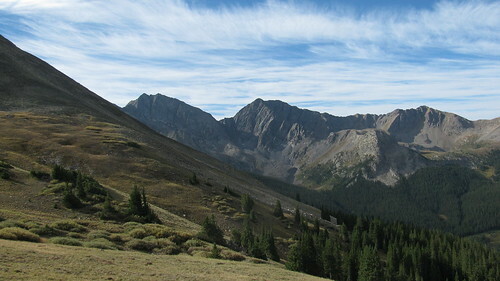 While we were discussing the details, however, I remembered that earlier in the summer, we had, in fact, considered attempting to climb a 14er, but had only gotten as far as deciding that prudence would dictate choosing one of the “easier” ones for our first attempt. All-in-all, I had to borrow hiking poles (I am sooo glad we decided to use them!) and a larger backpack from friends. I bought a warm rain jacket and rain pants from the Aspen Thrift Shop, and we bought a couple of extra water bottles once we got to Buena Vista. We started off as suggested - early in the morning (6:10 AM) and dressed for cool temperatures. Although it was still dark, we ended up walking the initial 2.1 miles from the parking lot to the trailhead with about 15 other people. A beautiful almost-full moon decided to join us. We ascended slowly (also recommended for newbies), stopping frequently to rest and take in water and some food. After negotiating the Ute-Trail-like switchbacks from the trailhead to tree line, we arrived at the tundra clearing at about 9:30 AM. We reached the top of the upper tundra switch backs at about 10:30 AM and finally made it to the summit at 11:45 AM – just ahead of our noon turn around time. We had finally officially summited our first Colorado 14er (sounds like more of an accomplishment than “bagged”)! 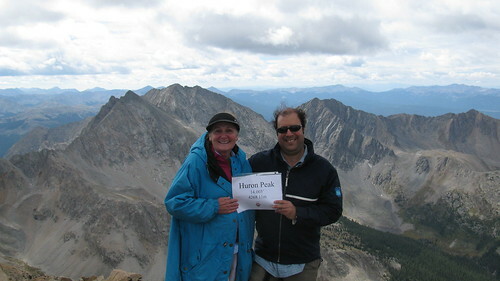 At the top of Huron Peak, we celebrated, taking in the overwhelming views with disbelief that we had actually done this. After a brief rest, we signed the summit book, took a few photos, and decided to descend when the wind started to gust a little. We acknowledged how lucky we had been with the perfect weather (not too hot, not too cold, no rain), and the reassuring company of our fellow hikers who encouraged us to “keep going” during our trek. After the novelty and exhilaration wore off, part of the way down, we wished that we could “beam down” to the bottom – Star Trek-like, but of course we could not. It’s a little difficult to enjoy the scenery when one’s feet are begging for mercy, but at least we had enjoyed it on the way up. We finally made it to our car and drove back to the motel. This is when we really realized that we no longer had any hot springs built into the plan, and we were too tired to track down any nearby ones at that time. We decided that even though we would have to wait for a day, we would have to settle for a plain old hot tub when we got home to Aspen. Now that we’ve conquered Huron Peak, we can’t wait to try more of the 14’rs – maybe even some of the more difficult ones around Aspen itself eventually. We will, of course, need to be more prepared for these, physically and mentally. At some point, I’d like to find some of those hot springs too!